The Investment-Readiness Thermometer, illustrated full-size below, is a simple way to share a common understanding between concept development teams and executives who hold investment decision-making power. 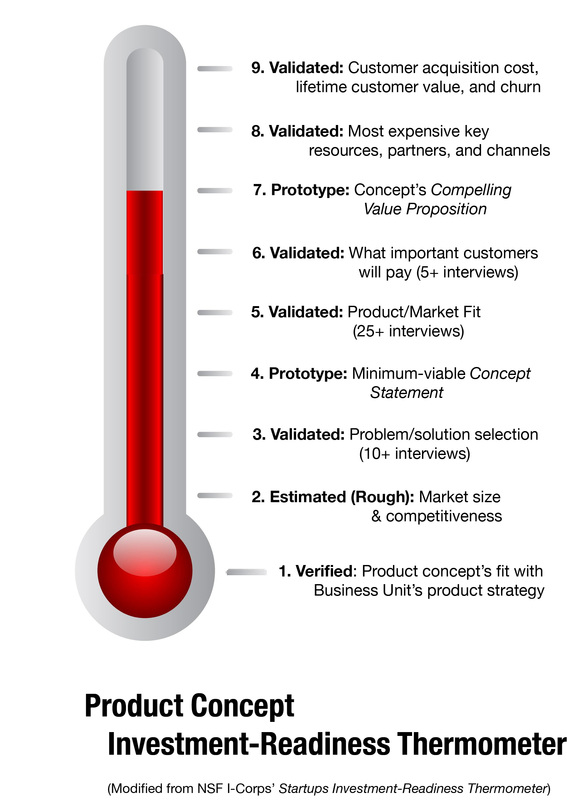 Using the thermometer compresses the time for commercialization and reduces early stage risks for B2B product concepts. At a glance, the thermometer delivers formal data-driven metrics for all of a firm’s investment decision-makers. The thermometer is a key tool of the Lean LaunchPad method used by the National Science Foundation’s Innovation-Corps program. In 2013, compared with a control group, 60% of the I-Corps’ new product concept startups received further NSF SBIR funds while only 18% of the control group received further investment. 60% versus 18% !! … Don’t guess at: who potential customers are, and what they value in your product concept. New product concept teams in large firms can use Lean LaunchPad skills to compress the time for commercialization, lessen early stage risks, and prepare investment-ready ideas. When following Lean LaunchPad principles, I-Corps teams must interview forty or more potential customers, either face-to-face or by in-depth phone interviews. Ten or more are interviewed to confirm the selected Problem/Solution hypothesis. Then at least twenty-five must be interviewed to advance above Degree 5 on the thermometer and at least five to advance above Degree 6. By doing this teams unearth who potential customers are and what these customers value in a team’s concept. Many I-Corps teams at first resented doing interviews because they felt it took time they wanted to spend heightening the concept’s features. Even after completing the Lean LaunchPad class their attitude was, “We know who the customers are and we know what they want”. After doing the Degree 5 round of interviews, many discovered that potential customers, who the team thought would embrace the product, didn’t care a whit about buying it. However, the teams also discovered a willingness to pay for the value created by the team’s concept in Degree 6 interviews with other cohorts in the idea’s value chain or in bordering markets. Compressing time for commercialization and reducing early stage risks for B2B product ideas are never-ending items for improvement in most firms’ product development processes. Since the 1960s, introduction of tools such as stage-gate and voice-of-the-customer proved instrumental in reducing time to market and failure rate. 5 The I-Corps’ Investment-Readiness Thermometer is a worthy addition to these evolutionary tools. A full-size illustration of the Investment-Readiness Thermometer is below. Following it are paragraphs describing what’s needed to move to the next highest Degree. Degree 1: If the concept doesn’t fit with the firm’s business model it will rarely receive investment for commercialization no matter what the C-suite says about wanting out-of-the-box ideas. Degree 2: If you look for it or buy it there is enough secondary information to make a quick estimate of market size and competitiveness— the key word is quick. As you go up the Thermometer and interview primary sources, you’ll be able to make more precise estimates. Degree 3: While a concept could solve a problem, it may not be suitable if necessary resources are not available, if customers won’t accept it, or if it causes new problems. Degree 4: Including no more than 3 key features, write a concept statement of 30 words or less. Degree 5: Interview a random sample of twenty-five knowledgeable customers across the value chain. Use elicitation techniques to place a customer in the Professor role. Degree 6: Now that you have the product/market fit, interview five early adopters and heavy users in that market to discover how much of the value you’ve created for them they will let you capture by price. Degree 7: Take the data and information you’ve gathered and analyzed and distill it into a compelling value proposition fitting the needs of desired customers. Degree 8: Validate internally the most expensive resources (skills, time, capital), probable partnerships needed, and distribution channels. Degree 9: Validate internally customer acquisition cost, lifetime customer value, and churn. Extending sales of present or modified present products to types of customers not presently served. I-Corps pays each 3-person team $50,000 to attend the Lean LaunchPad class and takes no equity in a team’s concept. Each team has a seasoned scientist as Principal Investigator. Principal investigators’ average age is 45 and many have previously commercialized product concepts. The I-Corps was inaugurated by the National Science Foundation in 2011. 2. http://goo.gl/rjHmVa and http://steveblank.com/2013/10/26/300-teams-in-two-years/ Steve Blank has helped 300+ I-Corps teams in the past 2 1/2 years. 6. http://steveblank.com/category/national-science-foundation/ Steve Blank’s post summarizing recent work with I-Corps teams in therapeutics, diagnostics, devices and digital health. Blank’s website at www.steveblank.com lists his twice weekly posts and videos on the I-Corps, his books, and a downloadable copy of his May 2013 Harvard Business Review article Why Lean Start-Up Changes Everything.